After weeks of sleep deprivation I have finally decided to ferberize my little R. I've been nursing him to sleep the last few weeks and have really seen the backlash of my actions with little R waking up more and more frequently throughout the night demanding to be nursed back to sleep. So firstly for anyone who is not familiar with the Ferber method - it is NOT the cry it out method where one just leaves their child to cry until they are so exhausted they fall asleep. Instead it is an assisting method that allows the child to learn to fall asleep on their own, without letting them feel like they have been completely abandoned. Basically the method asks that the baby to be put through a familiar n comforting sleep routine and be put into their cot while still awake. The parent says a few words such as good night, I Love you and rubs the baby's belly before leaving the room. A few minutes or even seconds later the child is bound to start crying as they realize no one will 'put' them to sleep and start to protest, the parent should wait 3 minutes before going back into the room and repeating the comforting words and rub the baby's belly for no more than 2-3 minutes before leaving again. This process is to be repeated with the time waited each interval extended from 3 to 5, 10 and 15 minutes. A baby should never be left to cry for more than 15 minutes without the parents comfort. Sounds ... Straight forward enough I guess and I'm very excited about the prospect of sleeping through the night again as this method will help the baby go back to sleep if they wake up in the middle of e night, not to mention effective within 7 days! I was tempted! 7:00 put down into cot lots of kisses and whisper good night - immediately after that Riley started whinging. 7:03 went into cot to comfort R for 3 minutes, during which R cried on and off. 7:06 left the room and R started crying again, seemed more upset but I resisted going into the room. I went back into the room to check on his and voila! Asleep! Although his position is now horizontal in the crib I was too nervous to move him in case I would wake him up, so I put a little blanket on him n left him to sleep. Wow I'm a bit surprised how quickly that was, I was expecting 2 hours of this but let's not jinx this and just wait and see... Stay tuned! 9:13 I waited 5 minutes to tend to little R and found him on his tummy, he wasn't crying mostly just whined a little n sniffled a bit. I turned him over n gave him a rub on his belly and told him I loved him so much and left. He immediately started to cry harder but for only 1 minute and slowly calmed down to whimpers. 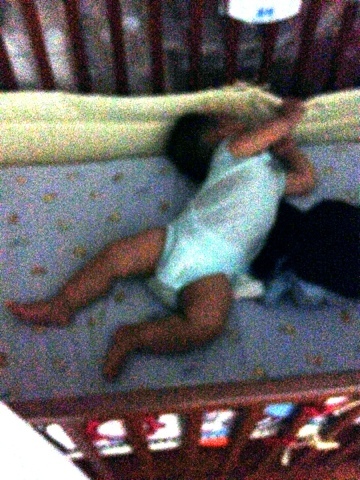 9:18 silence ... (well almost except for little R's yawns) I'm not sure if he's asleep or just calmed down. 1:30 R woke up and 'screeched'? But gently, and whimpered for several minutes, debated with myself whether to tend to him but held off since he didn't sound 'urgent'. I'm getting more n more impressed! Yesterday's crying episode lasted an hour! 4:07 little R woke up again this time with a strong cry that scared me a little I went to check on him to see if he was hurt in any way but luckily he was fine and just seemed upset that he was awake, so I rubbed his belly and left. 4:10 after a few minutes of crying that reminisced of yesterday's hour long tortured he suddenly fell silent and shockingly asleep! Yub! That's right folks, asleep!! Which means back to sleep for this tired mummy~! 5:25 fed the little guy and he's happily back to sleep, considering last feed was at 9 it's a pretty good stretch! Like clockwork little R always wakes up about 7am and today was no different! He seemed happy and content, and while I'm still a bit fog headed right now, I am still determined to see this through. One day down, six more days to go! Hi Kristy Ma! So, how did your story end? I'm trying to figure out what to do with my LO. How old is your baby? Thanks for describing your experience!